The freshest milk, from farm to fridge. We source both our organic and conventional rBST-free milk from local Pacific Northwest dairy farms. Our farm-fresh organic milk comes from cows that spend their day on open pastures and are grass fed with a supplemental diet of certified organic grain feed. From there, we homogenize, pasteurize (never ultra-pasteurize), and package the milk, before delivering it to more than 50,000 homes around the Puget Sound. It's what we've done right since 1920. Natural Bliss Sweet Cream Creamer - 16 oz. A naturally sweet and creamy flavored creamer. Natural Bliss Vanilla Creamer - 16 oz. Tempt the taste buds with this all-natural vanilla creamer. Natural Bliss Vanilla Almond Milk Creamer - 16 oz. Natural, plant-based creamer with hints of vanilla. Nutpods French Vanilla Creamer - 11.2 oz. Nut-based creamer with no added sugar. Nutpods Hazelnut Creamer - 11.2 oz. Unsweetened dairy-free creamer with a hint of hazelnuts. 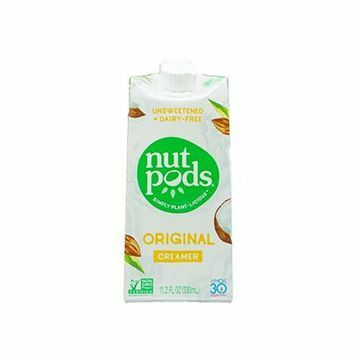 Nutpods Original Creamer - 11.2 oz. Unsweetened plant-based creamer in original flavor.